Your attitude to investment risk is initially identified using a questionnaire. This is discussed and agreed with you to ensure your objectives are realistic and achievable given the risk parameters set. An asset allocation model is calculated based upon your agreed attitude to risk. Your existing portfolio, if any, is then analysed and compared to the asset allocation model. An investment portfolio is created based upon your personal circumstances, requirements for income, growth or a combination of both, attitude to risk taking into consideration any existing portfolio. We measure a client’s tolerance to risk and then recommend a bespoke combination of asset classes. We select and analyse research from a wide range of market-leading resources (e.g. OBSR, Citywire, Standard & Poors, Morningstar and Lipper) to narrow down the circa 3,900 available UK funds to a few which we believe will be the leaders in the future. 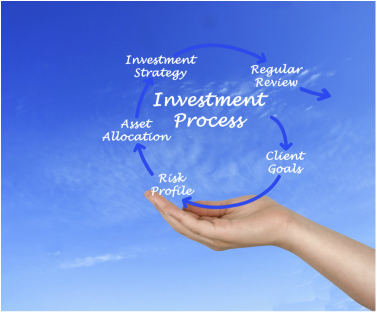 The investment funds and asset allocation models are regularly reviewed and reported to our clients at intervals agreed with them in line with our Levels of Service. At client reviews, investment portfolios are compared with the benchmark indices of the world markets together with the private investor indices. By monitoring these investments we aim to identify any funds that are losing value and replace them with funds we believe demonstrate good potential. Allan Investment Management gives you exceptional value for money, clear and timely reporting and peace of mind.